It’s back to work day for Castle star Stana Katic, who today begins filming Season 8 of the popular ABC series. It was a busy three-month hiatus for Katic, during which she shot two indie movies, The Rendezvous and Sister Cities, and got married. In addition to playing the female lead opposite Nathan Fillion, Katic has added a new role on Castle as part of her new contract: a producer. In her first interview since signing on for Season 8, Katic talks about the decision to return, provides a glimpse at next season that promises to shake things up under new showrunners Alexi Hawley and Terence Paul Winter, addresses her future on the show and what she would like to do next. For Katic, signing on for Season 8 was way more than a business decision. “Part of my thought process making the decision whether to do another season was creatively, what would that would look like,” she said. Factoring into the consideration was the fact that Castle creator Andrew Marlowe was leaving the series after Season 7. “He was part of making this character (Kate Beckett) what she’s become, and he has been part of this dialogue about how to create a strong female heroine,” Katic said. After taking a day to move offices from his previous job as co-showrunner of The Following, Hawley, along with Winter and the Castle writing staff, went on a writers retreat where they hashed out a bible for Season 8. How will Hawley and Winter shake things up? 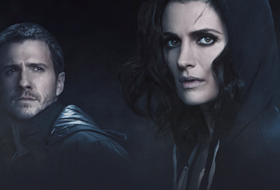 “There are a lot of shifts” planned, Katic said, noting that is excited about Hawley and Winter’s ideas while being coy about next season’s storyline and the resolution of Season 7 finale cliffhanger, which saw Beckett left pondering an offer to run for the New York State Senate. Still, she revealed some information about the opening two episodes and beyond. 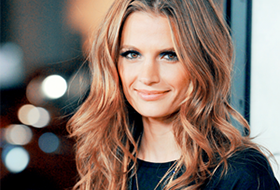 Katic, who has won two People’s Choice Awards for Castle, also is looking to expand beyond acting to directing as well as “finding great projects and helping to put them together.” She calls that a natural progression for actors, especially women, noting that many actresses who have won an Oscar have done so with movies that they had helped develop and produce. “It’s about finding great pieces and stories that I can be part of” that may or may not be starring vehicles, Katic said. Katic is starting work on Castle a week into production so she could wrap production on her second hiatus movie, Sister Cities with Alfred Molina and Jackie Weaver, which she just did over the weekend, and thanked ABC for graciously letting her carve time out for the film, which tells the story of four estranged sisters who reunite to mourn after their mother’s alleged suicide. While Sister Cities was shot in LA, action adventure The Rendezvous, in which Katic plays the female lead opposite Homeland‘s Raza Jaffrey, was a completely different experience. It was filmed in Jordan and marked Katic’s first trip to the Middle East. “It was unique and amazing,” Katic said about the shoot that had to deal with traveling through the desert in 50° C heat (112° F), holding the camera for camel crossing or redoing a take interrupted by a call to prayer. Because Jordan’s economy is not as strong as America’s, the local film industry has to make do with less. “People try to make films happen with a bit more ingenuity, and there is something very charming about people’s generosity and desire to make it happen,” Katic said. In addition to the two movies and the wedding, Katic took time this summer to work on her ATP foundation, which promotes alternative travel. She spent time meeting with people from Google, Metro as well as the White House discussing the issue that she is very passionate about. “I think this project is part of next chapter of what our planet will look like as within the next 10-20 years 70% of the planet’s population will live in cities,” she said. Katic is trying to set an example — making the commitment to travel by public transport or bike at least once a week.